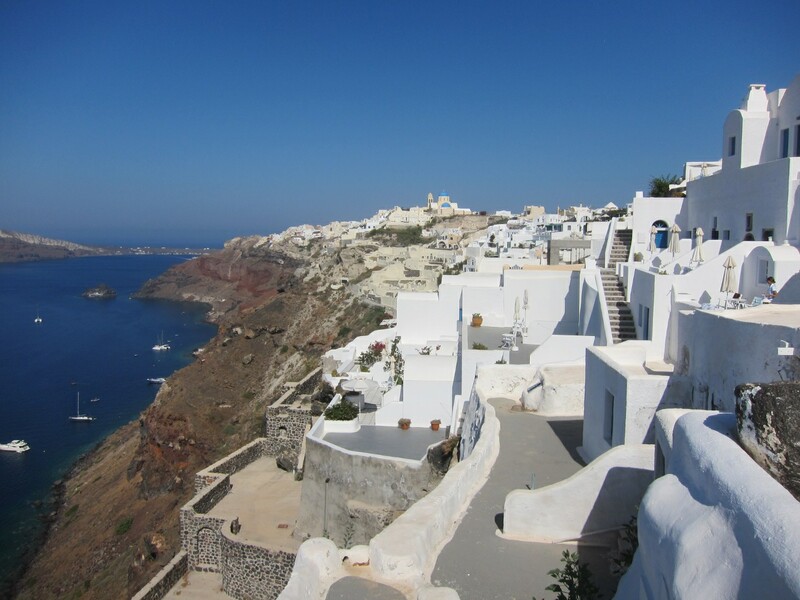 We were in spectacular Santorini. Dreamy cool breezes. Clear skies. Glorious sunshine. To top it off, a dreamy sailboat cruise awaited us. What more could we ask for. Nothing really . . . except that only applied to 3 of the 4 passengers in the shuttle van. The Husband, in his esteemed brilliance had ignored expert advice and was now looking decidedly pale. 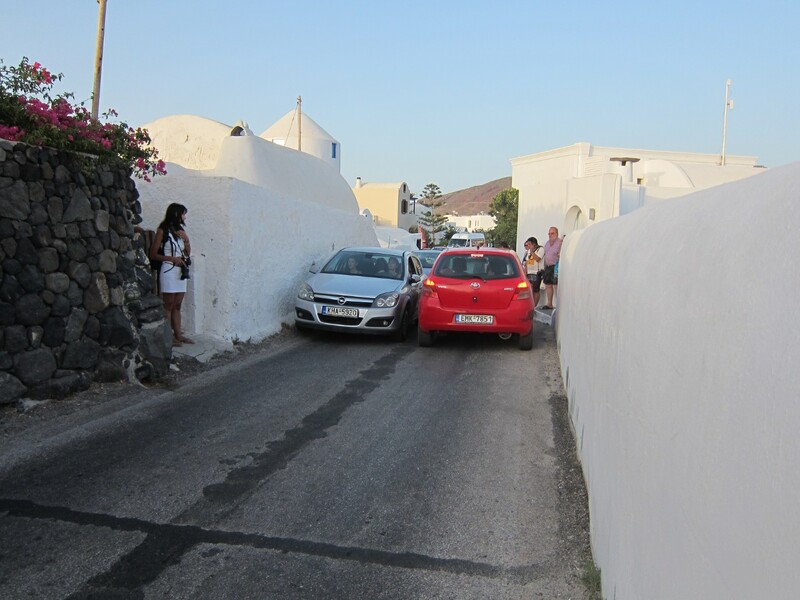 As we zoomed along the windy roads from Oia down towards the Vlychada marina, our driver who was born and raised here, happily showed us the sights along the way. 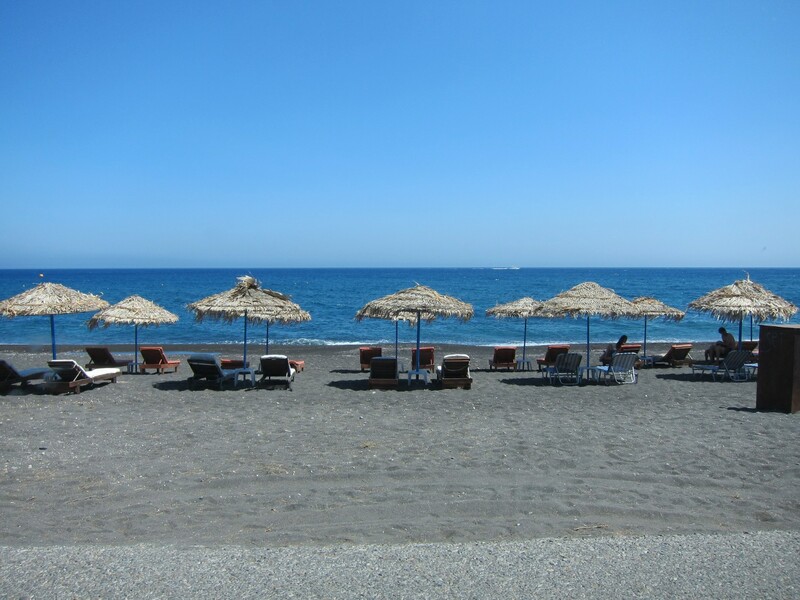 The bustling village of Fira, the local Vinsanto vineyards and the strange sight of volcanic beaches that can get so hot, walking planks are provided for the tender footed. Sadly, none of this was impressing Peter. He had overestimated his sea faring capabilities following Croatia and was now regretting it. The transfer journey was further than expected. The roads were windier than he thought. And even before we were near any boats, lunch no longer wanted to stay put. He did not look happy. Instead, he really looked green. Instead of taking his travelcalm tablets early, he left it too late. And now, everything was churning as he clutched onto his little barf bag. More than half an hour later, we arrive at the Marina. To his credit, he was still holding it together. But like the old adage, out of the frying pan into the fire, the winds had picked up considerably and we were now looking down the barrel of a 3 hour cruise in choppy seas. The sailboat we were meant to get on had just returned from another cruise and a couple of the passengers looked a bit worse for wear. “Just a bit rough out there!” one of them chirped, as she hopped off. I know! We can see that! Whilst we wait for the crew to clean up and restock, we see other boats returning to the safety of the marina, tossed to and fro by the waves. Their tall masts swinging madly in the air from side to side, like a finger waving no. Almost like it was telling us, nope, too windy today! However, the boats weren’t retreating back to the marina. It was just changeover time. Like our sailboat, they were back to swap over passengers. Ten minutes later, our boat was ready to go and the crew were waving us on board. Peter was amazingly still in one piece. 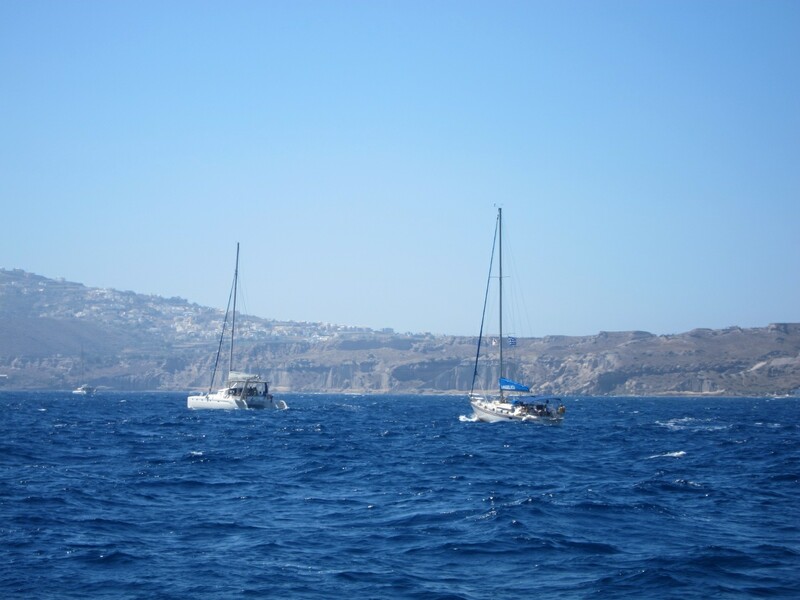 So, we all got on and after introductions and formalities, (most importantly, check the direction of the wind, if you are going to throw up overboard) we headed out along the south coast of Santorini sailing west towards the Caldera . . . .